All the Universe is now watching. 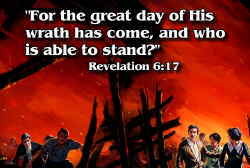 The book of Revelation tells us that in the Judgment court in Heaven God stands up. When a judge stands, he gives the verdict, and the Judgment is over. When the Judgment is over in Revelation 14:15, several angels come out of the Heavenly temple and they all have the same basic message: It is Harvest Time on Earth – Jesus is coming again -- Jesus is ready to come and take His own people to Heaven! The next two chapters of Revelation (Revelation Chapter 16,17) tell the terrible story of God’s Final Judgments on earth. These Judgments are called the Seven Last Plagues. The plagues that fell on Egypt were an example of the seven last plagues. Stubborn Pharaoh would not listen to God’s decree to "Let my people go!" Now, Satan is like the Pharaoh -- refusing to let God’s Remnant people go. Satan plans to kill every one of them! 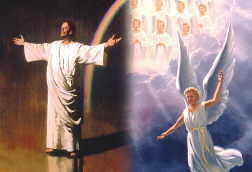 But, God’s judgments come sure and fast on land and sea, in the air, on people’s bodies and on cattle. 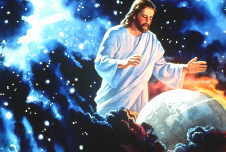 God is withdrawing His Holy Spirit of protection from the earth. Perhaps man’s chemical, biological and other weapons of warfare backfire against those who made them. There is now nothing to stop evil spirits from going into the minds of anyone who has received Satan's mark and rejected God. It is a time of terror! People wish they were dead. However, God’s hand is over His people. They may suffer from a few of the results of some of the plagues going on around them. But, the sicknesses do not touch them. God has His hand covering them! Satan cannot kill them now! Their faith is tested, yes. It almost seems like God has let them go. It looks like evil men will kill them too. The remnant people hang on to God's promises when it looks like everything is lost. As God's people look around them, they see that God is protecting them. Not one of God's people is dying in the Plagues. The Holy Spirit has withdrawn its protection from the world, but it has not left God's people. The Holy Spirit gives them hope and super human power to be faithful! Then a small black cloud appears in the Heavens. Go to the Next Section: God Saves Man From Earth to find out what it is.